The Notre Dame Cathedral, one of the most visited landmarks in Paris, the French capital, was engulfed in flames yesterday (15th) evening as a catastrophic fire tore through the historic structure, collapsing its spire as fire officials raced to save the monument from total destruction. 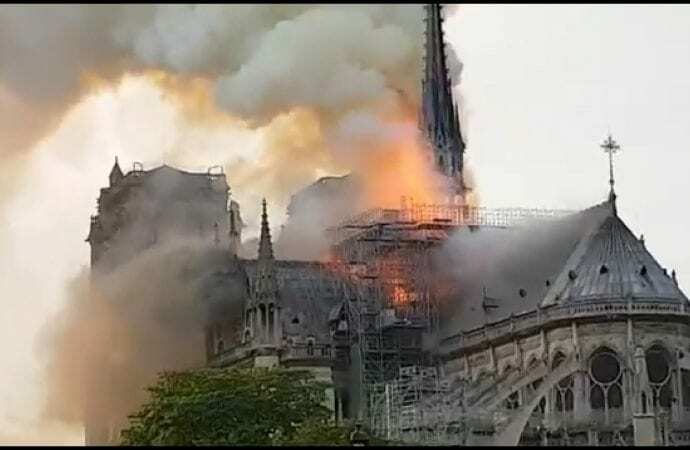 The fire broke out just before 7.00 p.m., minutes after the cathedral, which has been undergoing extensive renovation work, closed to the public. Around 30,000 people visit the church daily. The fire burned for several hours, destroying the 850-year-old cathedral’s iconic spire and roof before firefighters contained the blaze early Tuesday morning. Church authorities say that the entire wooden interior, which dates from the 13th century, had burned and likely to be destroyed. However, emergency services say they were trying to salvage as much artwork as possible adding that nearly all of it was able to be removed and saved. According to cathedral authorities the Crown of Thorns, said to have been worn by Jesus Christ before the crucifixion, the tunic of St. Louis, a pair of bell towers immortalized in Victor Hugo’s tale “The Hunchback of Notre Dame”, along with the cathedral’s elaborate stonework façade have been saved.